I invite you to take a moment and look at this photo. Really look at it. 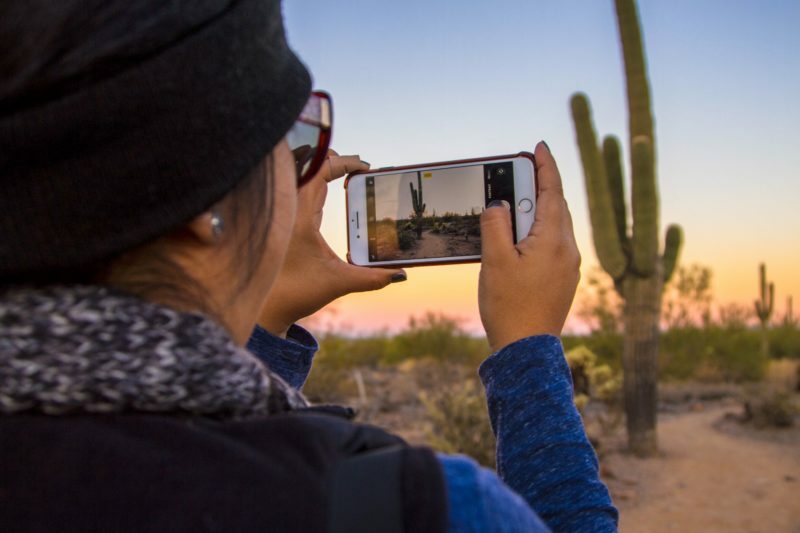 Can you see the differences between the image on the phone and the beautiful sunset being photographed? Are you seeing life through a filter? I visited my great aunt in California for the first time when I was 16 years old. I was so excited and had my first camera and was taking lots of pictures. At one point my great aunt came up behind me and said, “If you’re always looking at life through a lens you’re going to miss it. The camera distorts what you see.” Being a teenager, I listened respectfully, put down my camera for a few minutes and looked at the view of the hillside off her deck, and then returned to taking photos. And yet…her words remain with me to this day. By putting down the camera and really listening to her, I heard her message loud and clear. In those few minutes, without realizing it I had taken a mental photo of that hill outside standing on her beautiful redwood deck in Silver Lake. I will remember the expansive view…it dotted with only a few homes back then…the quite cool breeze on my neck…her humming bird feeder …the sounds of passing cars in the distance. I treasure that moment and I’m grateful I have it since it has been over 30 years since she has passed away. And that mountain side in California is now filled with hundreds of homes. We’re moving much closer to the shortest season of the year, summer. A time when many of us may take a family vacation or spend a bit more time outside with family and friends. Yes, you’ll be taking photos of these moments, and I would also like to invite you as my great aunt did with me, to put the camera (phone) down. Listen for the laughter and comments of those that you are with…smell and taste the food…notice the breeze…its temperature…how it might feel on your neck or move your clothing. Look into the eyes of those that are speaking or linger and watch the sun slowly setting. I promise you that these memories WILL stay with you in a more meaningful way, even if you don’t have a photo to show for them.